Emjoi Epilators for Women Reviews. 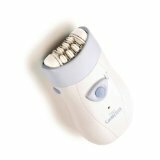 Emjoi Epilators AP-18 Emagine Dual Opposed 72 Tweezer Head Epilator. With 72 tweezer heads it takes less time and passes to remove your hair making your skin silky smooth. Features include the patented Glide Technology, the Silver Ion Technology, dual opposed staggered heads, and exclusive middle lifting fingers to lift flat and short hairs for quicker and smoother cutting. Emjoi AP-9L Epi Slim Cosmetic Hair Remover is battery operated making it easy to take with you to use on a trip. Great for doing touch-ups. Gentle epilation from the narrow strip of tweezer-discs. Emjoi AP-9T Tweeze Tweezer is battery operated, uses 2 AAA batteries that are not included. No scratching, pulling or irritation like you get with most other standard tweezers. Painless removal of even the smallest and finest hair. Will tweeze 30 times quicker than other standard tweezers. 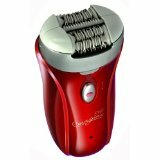 Emjoi Epilators Model AP-10R Soft Caress Cord/Cordless Hair Remover. The hypoallergenic tweezer discs are 24 karat gold plated. This epilator will remove hair efficiently and quickly with reduced pain using pain reduction technology and a massaging finger attachment. The soft grip feature is ergonomically designed to make it easier to control while using to remove the hairs on your underarms, bikini line, arms, legs, and individual hairs on your face. Your skin will be smooth and silky after using the AP-10R. Included with Emjoi epilators is an adapter, carrying pouch, 110 volt adapter, cleaning brush, and a massaging finger attachment. Emjoi AP99 Optima Epilator kit includes a Loofa sponge, and a deluxe carrying case. The epilator removes hair comfortably and quickly using 36 tweezers. Can be used on your underarms, bikini line, legs, and on your arms. Also features an interchangeable dual function shaver head with a long hair trimmer. Emjoi AP-96 OptiMini Epilator is electrically operated. This epilator has a unique epilation head that has dual opposed tweezers. This unique head holds the skin taut reducing the pulling and discomfort. Removes hair keeping your skin smooth and silky for up to six weeks. It does this by removing the hair from the root. There are a total of 30 tweezers. Emjoi AP-10LR Light Caress Epilator has 36 patented 24 karat gold plated patented tweezer discs. These discs remove the hair from the root keeping your skin smooth and silky for up to 6 weeks. Discomfort is greatly diminished using the patented pain reduction technology. Hard to see hairs are illuminated by a light. Epilator has a soft touch grip and can remove hair that is as short as .5 mm. Emjoi Light Caress Electric Hair Remover is the newest epilator to be added to the Gently Gold Caress Family. Hard to see hair is illuminated by a bright light. Uses 36 tweezer discs that are 24 karat gold plated and hypoallergenic. Pain is diminished using Pain Reduction Technology along with a massaging finger attachment. Hair is removed from the root even as short as 0.5 mm giving you that silky and smooth skin. Emjoi Epilators Model AP-9PB Gently Silken is Rechargeable and uses 18 tweezer discs and 2 speeds to remove hair and give you a silky smooth skin. It is rechargeable and includes a 3.6 volt adaptor for recharging. Designed to give you 4 to 6 weeks of smooth skin from your head down to your toes. Can be used for your bikini line, underarms, legs, and even gentle enough for using on your face. Emjoi After Epilation Cream with Hair Growth Inhibitor will help to relieve the irritation that you can get from epilation. It also slows the regrowth of hair while leaving your skin soft. Formula is fortified with propolis and aloe, and this cream is safe to use all over your body.